Having only stuck to the conventional delivery options like MacDonald’s or Pizza Hut, we decided to try Foodpanda. Foodpanda is a food delivery service that delivers almost all types of food to you doorstep, depending on your location. 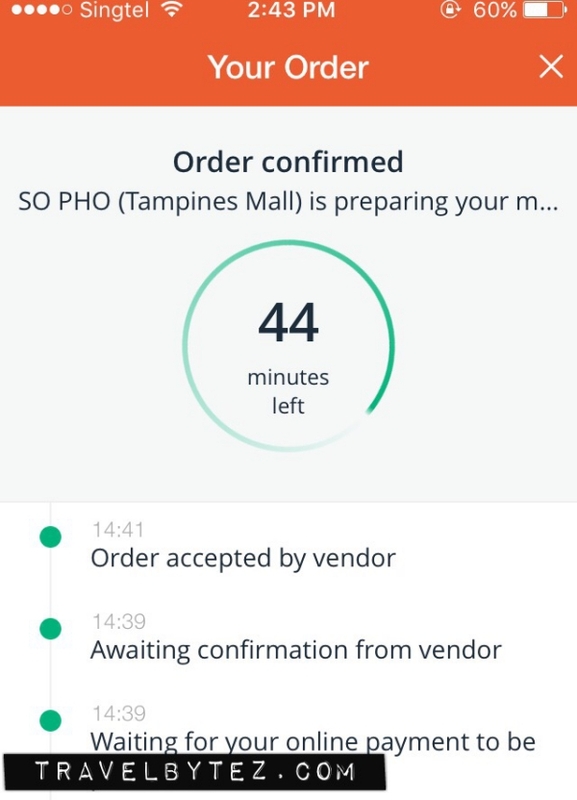 There is a minimum order to fulfill on top of a S$3 delivery charge, but if you factor in the time you save it is not that bad a deal (especially if you have very hungry people to feed and/or extremely lazy to go out to get food). Enter the postal code of your delivery location. Choose from a range of available restaurants that deliver to your area. Once you have found that menu that you like, just add it onto your cart. Once you are done with your selections, check-out by either cash, credit card or Paypal payment. Wait for your food to arrive, and monitor the progress via the app so you know which stage your food preparation is at. For our maiden order, we ordered in for lunch one day from a nearby Thai Restaurant via the website. The restaurant was called “Sweet Basil” and we had never tried it before and thought to go for something new. Payment was made via credit card and once the order was made we waited in anticipation only to be disappointed. To our horror, the restaurant had called about 40 minutes from our order to inform us that they missed the order and would be preparing it from that moment on and it would take approximately another 40 more minutes. Not willing to wait any longer we called “Sweet Basil” back and canceled our order. In addition, we also called Foodpanda and cancelled our order, which was confirmed by the Foodpanda representative on the other end. However, just as we were about to finish lunch (at the canteen), the Foodpanda delivery guy had called to say he had arrived! 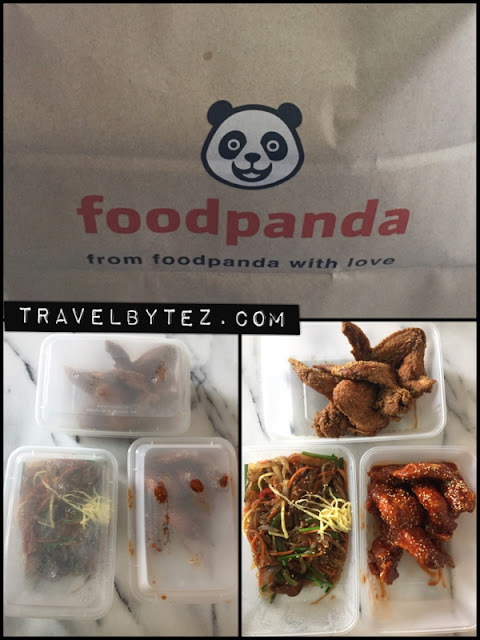 Somehow the communication between the restaurant and Foodpanda was not conveyed effectively and our order was a casualty of that miscommunication. It could (also) be that the Foodpanda system was not working well that day, and/or that the restaurant was not really that tech savvy to handle such a food delivery option. At least, it should not have been the restaurant to contact us directly but Foodpanda to inform of the delay etc… Instead the restaurant called directly with a ridiculous explanation that only added to the confusion. So it can be said that the first experience was pretty bad. The only saving grace of this was that at least the money was refunded. Despite having the initial bad experience, we decided to try out the service again. It was the New Year holidays and we were simply too lazy to cook or go out to eat. Besides, the postal code was different so the options were different too. 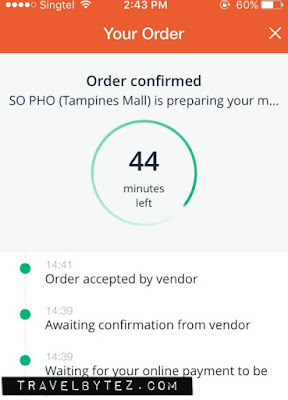 This time we ordered “So Pho” from Tampines Mall. The order this time was done via the (iOS) Foodpanda app and it was simple. We ordered beef noodles (soup), basil leave chicken rice and summer rolls. It wasn’t exactly cheap, but the pricing is the same as if you were to dine in and the S$3 delivery fee can be taken as the transportation fee it would have taken us to travel there and back. The food arrived within an hour (about 45 minutes). The food came well packed and with “So Pho” packaging (i.e. the soup container and plastic bag were the restaurants). For the beef noodles, the pho, soup and condiments were separately packed so that the noodles would not be soggy. A plus point would be that the soup was delivered piping hot, quite a feat when it was just a normal paper container holding the soup. Cutlery was also provided. Seeing how successful lunch was, we decided to order via Foodpanda again for dinner. This time it was “Soup Spoon”. We had gotten 2 flatbread soup sets with came with a drink. While the soup portioned served when dining in is slightly larger, the portion that came with delivery was smaller but still substantial (if you are not starving). The food arrived within an hour (about 45 minutes). For $11.20 per set, it was worth it. The app tracking even notifies you when the food is picked up, sent your way, and when the delivery is at your doorstep. Likewise with “So Pho”, the “Soup Spoon” also came with their own packing and cutlery: the soup and bread was packed in a styrofoam container that housed both together and retained the warmth of the soup. The chicken ragout stew and beef goulash were not that nice, but the flatbreads were appetizing enough. The portion makes good for a light meal. The next day, you guessed it, we were too lazy to move and so it was off to FoodPanda again. This time we tried ordering from “Chicken Up” located in Tampines. 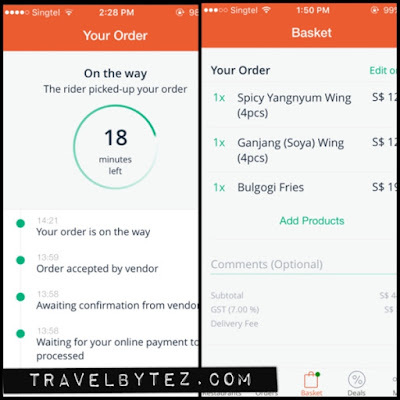 Although FoodPanda was experience a high demand in orders, our order came within 75 minutes. Our order consisted of Jabchae, Soya Chicken Wings (4pcs) and Yangnyum Chicken Wings (4 pcs). This was the most expensive order of all, as it cost a whooping S$40.66 (and that is not inclusive of the delivery charge yet!). It also felt the least value-worth meal. Plastic hand gloves and wooden chopsticks were not provided, although if you dine in at “Chicken Up” they would provide plastic hand gloves and cutlery to customers. Moreover, the restaurant had no personalized delivery bags etc… This further detracted from the experience and value from the meal (eating in might be a better option). For dinner that day, we went with "Soup Spoon" again. It was still the flatbread sets but this time we had the clam chowder and Tokyo chicken stew which were much nicer than the soups we had the previous night. The order took within 50 minutes to arrive and the packaging was spot on, with the soups retaining their warmth – a perfect meal if the weather is a little chilly. Foodpanda as a service seems pretty alright, as long as you order from familiar restaurants and (if) your orders are straight forward enough, you should be fine. That and perhaps also depending on your location and choice of restaurant, would affect the delivery status further. Based on the complains online and from our 1 bad experience (so far) it would seem that restaurants that are not tech savvy (enough) or those of a smaller scale (i.e. wanting to just jump onto the bandwagon) seem to have an issue with utilizing the system effectively ensuing in confusion and delayed orders etc... It does not help that Foodpanda does seem to be strictly vetting the restaurants that do poorly. However, should you choose to order via Foodpanda, it also helps to remember that most restaurants close by 930pm and their last orders might be earlier (i.e. 9pm), so to avoid getting disappointed ordering early is a must. In fact, even if the stated delivery time is around 45 minutes, it would be good to be prepared that the delivery could take about an hour or so to arrive and since you can also order in advance, it would not hurt to order your food earlier (to avoid disappointment). Apparently, the Foodpanda delivery fee varies by restaurant but for all the orders we had made it was a standard S$3 with a minimum order of S$18. The overall experience has been acceptable and we would definitely give it another try for the other restaurants (just the ones that we are more familiar with). very bad experience, their system showed all status correctly until their delivery picked up and on the way, then I awaited around 3 hours , I did not receive my food, after checking their website there were no any contact phone number found but only two options either send email or live chat, finally when I tried live chat they replied it was their system fault and the order get cancelled automatically. my food will not deliver and only they can do is to refund the order amount and give a voucher. the customer service is very bad and unprofessional. very disappointed , this is happening second time worst experience with Foodpanda. 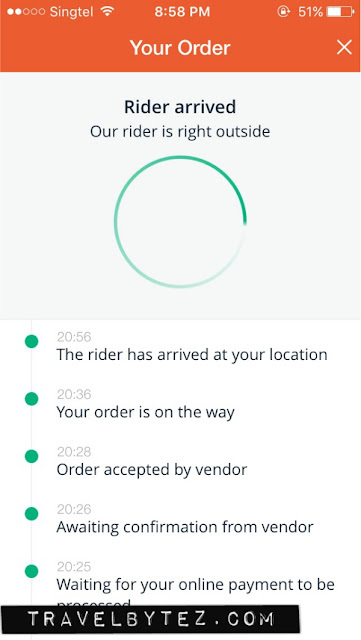 After latest app update, Food Panda standards seems to have dropped a bit with the food delivery timings, but otherwise customer service seems alright. I am not sure which country you are located in, but for me the live chat is pretty responsive and there is a number to call locally (within working hours of course) to check on your order. Ordered food, took order, paid through Paypal... nothing happened! After a 2 hour wait, saw on app that the order was cancelled because they had problems with Paypal. Did not even bother to message us! Money taken ... must wait for 14 days! This is service! I've never used PayPal, but payment via credit card (as well as refunds) were prompt (at least from what I have experienced).